[By Nick] I use to love these Friendly’s sundae cups growing up. They were a staple in my family’s freezer for those times my siblings and I wanted to go to Friendly’s yet my parents weren’t in the same mood. I don’t blame them seeing as little kids running around everywhere isn’t exactly the best dining ambiance. For some reason though I haven’t had one in years and was a little overwhelmed when I saw all the varieties they make now. From what I remember there was always the original sundae cup, a Reese’s version as well as a Snickers one. Now they have 8 different varieties to choose from. Seeing as we don’t cover too many banana products on the site, I decided to pick up one of their Jim Dandy Sundae cups to try. 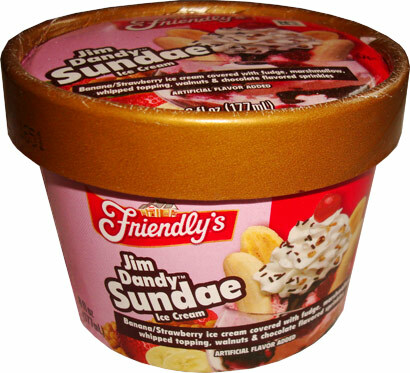 For those of you who don’t know, The Jim Dandy is a normal sundae on Friendly’s menu which consists of “5 Scoops of ice cream, strawberry or pineapple, marshmallow and chocolate topping, a freshly split banana, sprinkles and walnuts”. 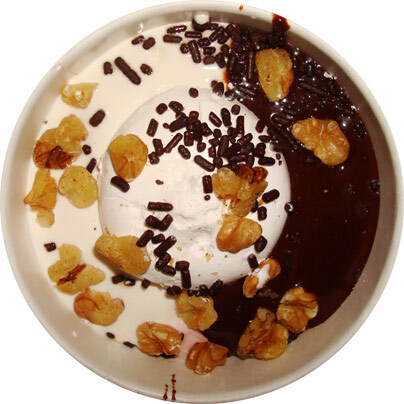 It is more or less Friendly’s take on a banana split even though they do also serve a more tradition banana split as well. 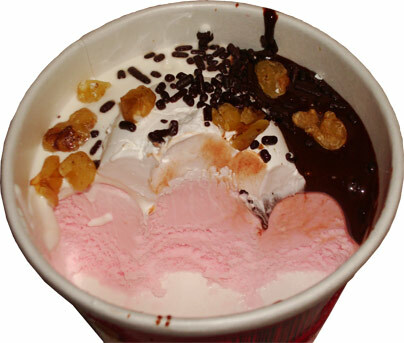 Similarly to its namesake, the sundae cup is made up of “Banana/Strawberry Ice Cream covered with fudge, marshmallow, whipped topping, walnuts & chocolate flavored sprinkles”. Now I’m curious as to what exactly banana/strawberry ice cream is. They either have the two ice creams swirled together, have them half and half as the backspace in the description sort of hints at or they could go along the way of strawberry banana yogurt and just have everything blended into one full product. Truthfully, I’m rooting for the first option but I guess we’ll just have to see what’s going on in there. *Quick Note: Unlike Dubba, I do like banana products artificial or not. Okay there we go. As you you can see, they went the latter route and blended the strawberry and banana into one base. You know how I compared that option to strawberry banana yogurt? Well that’s exactly what it tastes like. Seeing as I’m a fan of that not quite strawberry but not exactly banana flavor, I found myself enjoying the base. Both of the sauces were top notch as well. The fudge was decadent, very gooey and full of some great chocolate flavor. From what I remember, this fudge sauce seems to be better than it was when I was younger. The marshmallow sauce was also quite gooey and made me realize that I need more of this stuff in my life. Literally I could probably eat a container of this stuff on its own. Okay, getting back on track, besides texture, the walnuts and sprinkles didn’t add much to the flavor profile. Lastly, whipped topping is whipped topping so there’s not much to delve into on that front. All in all, this was a solid little sundae and I will be buying more Friendly’s cups to reminisce about my youth. Buy Again? I could see myself keeping these stocked in my freezer. Danielle, they were always a special treat around my house. My siblings and I would fight over the ones we wanted. Seeing as I was the youngest, I didn't win too often. Mitch, my childhood in one little cup.